New York's location within the U.S.
Otsego County is a county in the U.S. state of New York. As of the 2010 census, the population was 62,259. The county seat is Cooperstown. 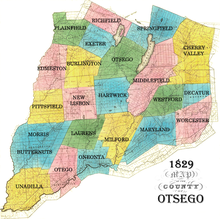 The name Otsego is from a Mohawk or Oneida word meaning "place of the rock." 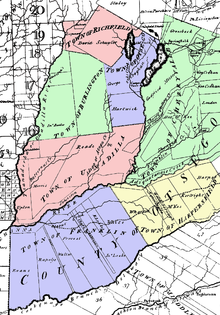 In 1789, Ontario County was split off from Montgomery. The area split off from Montgomery County was much larger than the present county, as it included the present Allegany, Cattaraugus, Chautauqua, Erie, Genesee, Livingston, Monroe, Niagara, Orleans, Steuben, Wyoming, Yates, and part of Schuyler and Wayne counties. Otsego and Cherry Valley together roughly covered the area of modern Otsego County, while Harpersfield covered the area south of the current county as far as the Delaware River. Alexander Harper, commander of the county militia, from Harpersfield. In 1795, a piece of Otsego County was joined with a portion taken from Albany County to create Schoharie County. 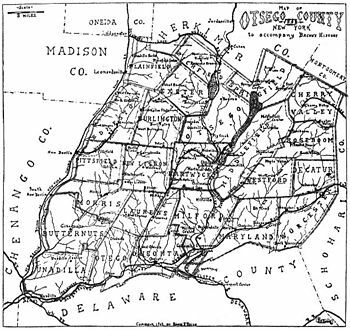 In 1797, a piece of Otsego County was joined with a portion taken from Ulster County to create Delaware County. According to the U.S. Census Bureau, the county has a total area of 1,016 square miles (2,630 km2), of which 1,002 square miles (2,600 km2) is land and 14 square miles (36 km2) (1.4%) is water. Otsego County is in central New York State, to the west of Albany, southeast of Utica, and northeast of Binghamton. The county is part of the Central New York Region and Mohawk Valley Region of New York State. The county is considered by some to belong to the Southern Tier region of New York State, and is the northernmost county of the Appalachian Region. As of the census of 2000, there were 61,676 people, 23,291 households, and 15,115 families residing in the county. The population density was 62 people per square mile (24/km²). There were 28,481 housing units at an average density of 28 per square mile (11/km²). The racial makeup of the county was 95.80% White, 1.75% African American, 0.23% Native American, 0.63% Asian, 0.05% Pacific Islander, 0.50% from other races, and 1.05% from two or more races. Hispanic or Latino of any race were 1.90% of the population. 15.0% were of Irish, 14.9% English, 14.9% German, 11.3% Italian and 9.1% American ancestry according to Census 2000. 95.4% spoke English and 2.1% Spanish as their first language. There were 23,291 households out of which 29.60% had children under the age of 18 living with them, 51.10% were married couples living together, 9.50% had a female householder with no husband present, and 35.10% were non-families. 27.00% of all households were made up of individuals and 11.60% had someone living alone who was 65 years of age or older. The average household size was 2.43 and the average family size was 2.94. In the county, the population was spread out with 22.70% under the age of 18, 14.40% from 18 to 24, 24.30% from 25 to 44, 23.60% from 45 to 64, and 15.00% who were 65 years of age or older. The median age was 37 years. For every 100 females there were 93.10 males. For every 100 females age 18 and over, there were 90.00 males. The median income for a household in the county was $33,444, and the median income for a family was $41,110. Males had a median income of $29,988 versus $22,609 for females. The per capita income for the county was $16,806. About 8.80% of families and 14.90% of the population were below the poverty line, including 15.80% of those under age 18 and 8.20% of those age 65 or over. Otsego County is a true swing county and bellwether; it has chosen the winner of the presidency for the last three decades. In 2004, Otsego County voted 51-48 percent in favor of George W. Bush. In 2008 and 2012, Otsego County voted in favor of Barack Obama. Democrats are prevalent in the City of Oneonta and Village of Cooperstown, whereas the majority of voters in many of the surrounding towns are registered Republicans. Otsego County is the only county in New York that names its legislative body the Board of Representatives. It consists of members elected from 14 single-member districts. The Board Chair is David Bliss (R). The county also has an elected District Attorney, County Treasurer, County Clerk, and County Sheriff. Along with Herkimer County and the eastern portion of Oneida County, Otsego County is considered part of the Utica television market. The Village of Cooperstown (home of James Fenimore Cooper, whose father William Cooper founded it) is located at the south end of Otsego Lake. 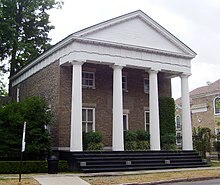 It attracts many tourists to the Baseball Hall of Fame and the New York State Historical Association museums. Cultural attractions also include the Glimmerglass Opera, with a summer season that draws many repeat visitors for stays. The primary contributor to the economy is healthcare: Bassett Medical Center, the headquarters of Bassett Healthcare Network and its more than 3,000 employees, is located here. The City of Oneonta has two institutions of higher education: Hartwick College and the State University of New York at Oneonta; A.O. Fox Memorial Hospital, an affiliate of the Bassett Network; major retail activity; and numerous small businesses. The county as a whole remains relatively rural, with dairy farming a contributing industry that has consolidated employment in recent years, although production has remained steady. ^ a b "State & County QuickFacts". United States Census Bureau. Archived from the original on July 16, 2011. Retrieved October 12, 2013. ^ Beauchamp, William Martin (1907). Aboriginal Place Names of New York (New York State Museum Bulletin, Volume 108). New York State Education Department. p. 174. Retrieved August 12, 2015. ^ "2010 Census Gazetteer Files". United States Census Bureau. August 22, 2012. Archived from the original on May 19, 2014. Retrieved January 6, 2015. ^ "U.S. Decennial Census". United States Census Bureau. Retrieved January 6, 2015. ^ "Historical Census Browser". University of Virginia Library. Retrieved January 6, 2015. ^ "Population of Counties by Decennial Census: 1900 to 1990". United States Census Bureau. Retrieved January 6, 2015. ^ "Census 2000 PHC-T-4. Ranking Tables for Counties: 1990 and 2000" (PDF). United States Census Bureau. Retrieved January 6, 2015. ^ Leip, David. "Dave Leip's Atlas of U.S. Presidential Elections". uselectionatlas.org. Retrieved 2018-10-24. ^ "WKTV.com | WKTV bringing CBS affiliation to Utica". WKTV.com. 2015-10-26. Archived from the original on 2015-10-27. Retrieved 2015-10-27. Butterfield, Lyman H. "Cooper's Inheritance: The Otsego Country and its Founders", New York History, Vol. 35, No. 4 (October, 1954), pp. 374–411. Wikimedia Commons has media related to Otsego County, New York.